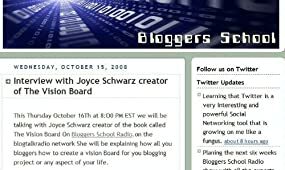 TUNE IN TO HEAR LIVE: Joyce Schwarz, author of THE VISION BOARD: The secret to an extraordinary life for a feature interview on the show Blogger School on Blogtalkradio on Thursday, October 16 @ 8 p.m. EST.http://www.blogtalkradio.com/bloggersschool Host of the show is John A Ciampa, founder, Blogger School. The Vision Board: The Secret to an Extraordinary Life to be featured on Blogger School Talk show program on Blog Talk Radio on Thurs, Oct, 28 @ 8 p.m. EST and 5 p.m PST. VISION FOR THE FUTURE OF BLOGGERS? Author Joyce Schwarz forecasts what's next on Blog Talk Radio interview with host John A. Ciampa,founder Blogger School. 3) why your blog may be the stepping stone to the next stage of your life not just your career! Props to host John Ciampa for the great work he's doing educating the next-generation of bloggers and citizen journalists! (left THE VISION BOARD by (right) author Joyce Schwarz, for more info on Joyce's emerging media marketing firm go to www.joycecom.com. The two U.S. satellite radio providers announced a merger of equals on President's Day. Under the terms of the agreement, XM shareholders will receive 4.6 shares of Sirius stock for each share of XM they own. XM and SIRIUS shareholders will each own approximately 50% of the combined company. Sirius Chief Executive Mel Karmazin, will become chief executive officer of the new company, while XM Chairman Gary Parsons will be chairman of the merged concern. The companies said that together they will have an enterprise value of $13 billion, including $1.6 billion of long-term debt. So actually Sirius is acquiring XM....we'll see what the world of radio thinks about this. And what about podcasting...who will own that iPod crowd -- will SAT radio be victors? www.greenstonemedia.net-- new women's radio network launching what they say is "entertaining, informative, and inspiring talk delivered in an engaging, inclusive way". On their website www.GreenStonemedia.net -- they say: We talk with women the way they talk with each other, with stories of hope and humor that foster a real sense of community among listeners. Listen to the Demos (here are links to demos of the shows on the new women's radio network). name of new women's radio network! who have identical, iridescent green stones..."
"In a small community on the Earth,"
every person and animal possesses a shiny green stone. cause the stone to become dull and gray until restitution can be made. Note, this info is taken directly from their website at www.idolunderground.com: American Idol Underground was created by Fluid Audio Networks (www.fluidaudio.com), a diverse team of techies, artists and music lovers who possess a wealth of Internet and music industry experience. Fluid Audio Networks is dedicated to using the vast distributive powers of the Internet to create new opportunities in all forms of media. In March 2005, Fluid Audio Networks created American Idol Underground under a license from FremantleMedia (www.fremantlemedia.com) who, in concert with 19 Entertainment Ltd. (www.19.co.uk), produce television's American Idol. The democratic spirit of the television show and its power to make any artist into a star prompted us to seek a partnership with the Idol brand. American Idol Underground says their goal in creating AIU is to use the popularity of American Idol to help emerging artists in all genres get their music heard. Artists submit songs to the American Idol Underground Web site. The songs are then guaranteed airplay on one of AIU's genre-specific Internet radio stations. Music fans listen and rate the songs. The more you listen and rate songs, the better your chances to win cool stuff. Higher rated songs get more airplay and the best songs from each genre win demo recording packages and other awards. American Idol Underground features artists of all ages and genres, including Rock, Rap, Country, R&B, Electronica, Jazz, Classical, World, Faith-Based, and more. We believe that every artist should have an opportunity to get their music heard! Yeah, there will be a few big stars that get their start on American Idol Underground, but we are more interested in helping lots of artists get the exposure they need to earn a living from their craft. RICK DEES DIGITHON -- DIGITAL HOLLYWOOD HIGHLIGHT.... taking over the spotlight at Digital Hollywood last week was celebrity radio personality Rick Dees and a 'wow' of an event called the first-ever DIGITHON. Click on thumbnail to see photo of celebrity radio personality Rick Dees promoting the first-ever DIGITHON. Organized to mobilize and motivate listeners around the world to help in the aftermath of Hurricane Katrina, the event which will be rebroadcast again on Friday, September 30 (according to website www.rick.com) was broadcast, streamed and podcast live from the lobby of the Loew's Santa Monica Hotel in conjunction with Digital Hollywood Fall '05 conference. Click on thumbnail to see photo of Dees' Digithon live from the Loew's Santa Monica Hotel at Digital Hollywood. The producer of Dees Digithon is a colleague of mine, the talented Kimberly King-Burns, a respected leader of Hollywood's digerati. As Hollywood2020 blogger Joyce Schwarz tip-toed into the LIVE Digithon studio at Digital Hollywood, Kimberly was there to greet us with her ever-present smile and the kidding question of "Are you slumming? "....of course, we were there to see the event in all its glory. Kimberly King-Burns is pictured in thumbnail photo. Almost at that very moment celebrity host Rick Dees gave tribute to King-Burns for her professionalism in working on the new Digital Dees efforts. You can get a peek at www.rick.com. Kimberly said she would be co-hosting too-- she has the voice for it ...but at the moment we stopped by she was busy with her producing and managerial duties. The event was a first for Digital Hollywood and the world. A live digital fund-raising broadcast streaming worldwide. Check out www.rick.com to listen to Rick Dees Digithon...the site promises a repeat Friday, Sept 30. Rick has been honored with many awards for his accomplishments, including his own star on the prestigious Hollywood Walk of Fame. He wrote and recorded “Disco Duck,” which became an unexpected runaway hit, hitting #1 and selling more than four million copies. That platinum record also earned him a People's Choice Award. Dees is probably best known for his internationally syndicated “Rick Dees Weekly Top 40.” The Rick Dees Weekly Top 40 reaches over 70 million people a week. The syndicated show is heard on over 350 radio stations in the USA, over 125 countries and 27 ships at sea, according to www.rick.com. FIVE TRENDS TO THRIVE, NOT JUST SURVIVE IN NEXT GENERATION ENTERTAINMENT AND MEDIA.....by Joyce Schwarz, moderator Digital Hollywood Next Gen Media & Entertainment panel and emerging entertainment expert & author. Photo shows, Fall '05, Digital Hollywood panel on Next Gen Media and Entertainment realities (Joyce Schwarz, moderator is at far left standing by podium) and second from right is comedian/producer Sinbad who added spice and zest to the panel discussion). Other panelists included execs from TV GUIDE SPOT, Program Partners, Carat Fusion and NCM. Watch future blogs for more details on their calls on the future of entertainment and media. Joyce Schwarz, author and blogger of Hollywood2020 and head of JCOM, marketing and emerging media, www.joycecom.com, offers five trends for film, television, entertainment (online and offline) and IT firms to consider as we move into the "Broadband Era" of next generation media and entertainment. Since 1992, Joyce Schwarz has become known for tracking trends and forecasting the future of media and entertainment in Hollywood and beyond. She is the author of several books and more than 100 articles on these topics. Shown here is "Multimedia: Gateway to the Next Millennium" which Schwarz edited and wrote with Robert Aston & other top experts on emerging media. Schwarz section is entitled "HOLLYWOOD USA" and covers the earliest new media and multimedia projects start-ups and traditional Hollywood got involved in starting in the early '90's. The book is still available at www.amazon.com. "For the past five years we have been either building the bridge or stuck in the middle of the path to Broadband, now we're truly entering the Broadband and on-demand era of content, production and technology. A new era requires that we all look at the roles of media and entetainment in a new light. Here are my five trends that are aimed at aiding you in thriving,not just surviving in the next decade,"Joyce Schwarz, JCOM, www.joycecom.com, author/marketing and biz dev consultant. TREND #1: Rise of Byte-sized content in this era of multi-tasking and information overload -- gaining and retaining attention is one of the biggest challenges. The rise of Byte-size content -- digital content that is available on-demand to viewers is offering content and rights holders a method to gain new followers and cut through the clutter. Content-2-go, advertainment (where advertising becomes entertainment like the BMW short films) and branded content where brands underwrite media and special events that then become the focus of content i.e. concerts, TV specials, live events (NASCAR) are all spin-offs from this trend. The ifilm/Viacom deal announced recently in www.paidcontent.org is one of the recent developments which may underscore the power and revenue value of Byte-size content. the TV SHOW "VERONICA MARS"
sign up to be involved. .
Carat has created in the past. to NCM's theatres for a special screening. new 'opps" for movie theatre events. producer is truly a guru on next generation media.